This painting is painted in acrylics on canvas to a size of 16" x 20". 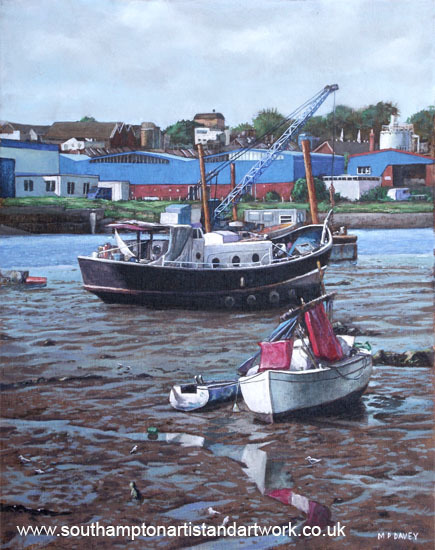 It features a well known view from the Northam Bridge at Northam, Southampton, looking up the River Itchen in the direction of St Denys, and onwards to Winchester. Here the tide is out and old, forgotten boats of all ages and sizes rest on the mudflats. Again this is a popular location with photographers and artists, notably with the interesting textures seen on the landscape and the way that the scene is constantly changing in different light and weather conditions. Painting the reflections in the water of the boats and sky is fun to do and helps to bring the artwork together.